Santa’s got a new and improved late-night snack with this peppermint take on affogato from Vallery Lomas, The Foodie in New York. 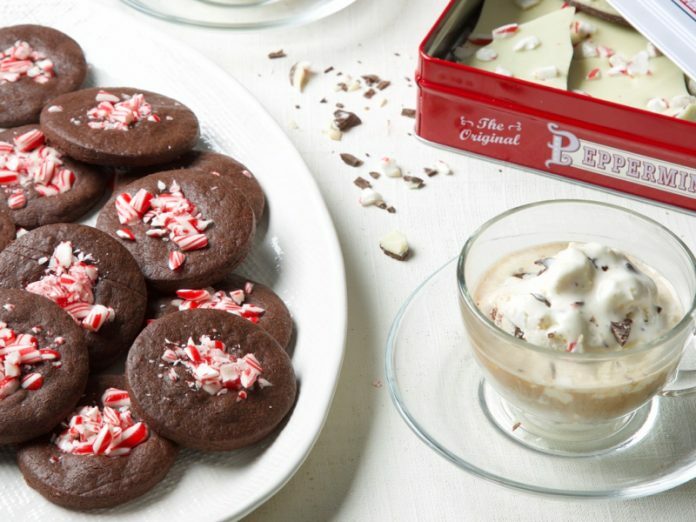 A no-fuss, no-churn ice cream gets a double dose of peppermint from extract and stirred-in bits of Williams Sonoma Peppermint Bark while cocoa candy cane cookies bring crunch and a hot shot of espresso introduces a dose of heat. Want some peppermint bark of your own to recreate this recipe? Don’t miss out on our Williams Sonoma Peppermint Bark giveaway! Scoop No-Churn Peppermint Bark Ice Cream into small tea cups. Place shards of Peppermint Bark in ice cream, and top with espresso. Serve with Chocolate Cookies. In a large bowl, stir together condensed milk, vanilla, and peppermint extract. In another large bowl, whisk cream until stiff peaks form. Fold whipped cream into condensed milk mixture. Gently fold in chopped Peppermint Bark. Pour mixture into a loaf pan, and freeze for at least 6 hours or overnight. In the bowl of a stand mixer fitted with the paddle attachment, beat butter and sugar at low speed until ingredients are moistened, about 30 seconds. Increase mixer speed to medium-low, and beat until light and creamy, about 2 minutes. Beat in vanilla. In a medium bowl, sift together flour, cocoa, salt, and baking soda. Add half of flour mixture to butter mixture, and beat for 30 seconds. Add remaining flour mixture, and beat just until a stiff dough forms, about 30 seconds. Turn out dough, and press into a square block. Wrap in plastic wrap, and refrigerate until firm, about 1 hour. Preheat oven to 325°F (170°C). Line a baking sheet with parchment paper. Roll dough to about ⅙-inch thickness. Using desired cutter, cut dough, rerolling scraps as necessary. Carefully place 1 inch apart on prepared pan. Gently press crushed candy canes onto top of cookies. Freeze for about 15 minutes. Bake until cookies are just set in center, 10 to 12 minutes. Let cool on pan for 10 minutes. Remove from pan, and let cool completely on a wire rack. Store in an airtight container for up to 3 days.